DC warned that stern action would be initiated against those impeding development initiatives. She warned that stern action would be initiated against those impeding development initiatives. “The administration will not spare anyone putting a spanner in the wheels of development. Development cannot be compromised. Anyone resisting development work have to go to jail, ” she retorted. 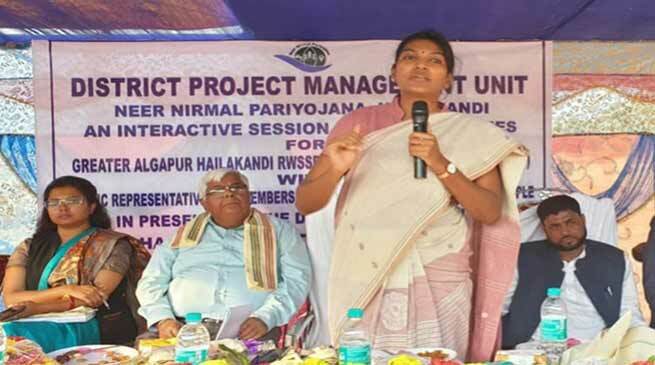 The Deputy Commissioner, who is on a mission mode to transform aspirational district Hailakandi to a developed district with her one-point development agenda, during her interactive meeting on Wednesday asked the protestors, who have stalled the laying of pipes of a Rs.105 crore Public Health Engineering Department’s water supply project, not to impede the construction work in the greater interests of the public. The protesters have obstructed the construction work for quite sometime on the ground that excavation carried out during the laying of pipes have rendered the condition of the road deplorable causing immense hardships to the pedestrians and commuters alike. They also demanded that the local people get a fair share of work in the project. Jalli directed the contractor to keep the existing road pliable and to address any genuine problems faced by the people. The Deputy Commissioner warned that licences of contractors not adhering to the government guidelines would be cancelled. MLA Nizam Uddin Choudhury warned that anyone stalling development works would not be tolerated. “Individual interest is not above greater interest of the people, ” said the local MLA. Choudhury sought the intervention of the Deputy Commissioner so that the piped water supply scheme that will benefit 80,000 people of his constituency goes on without any further hiccups.